Book Your Lake Trout Fishing Trip Today! Vertical jigging for lake trout is an extremely productive way of targeting these beautiful and aggressive fish, and an incredibly fun way to catch lake trout on light tackle using a hands-on technique. Proven throughout the years as a terrific alternative to trolling, vertical jigging allows anglers to impart the action to the lures, to feel the bites, and fight these powerful fish on light tackle. Our Sport Fish Michigan boats have the best equipment on board including the latest Humminbird electronics and Minn Kota trolling motors which allow us to find fish easily and stay on top of them - giving us even more opportunities to catch fish. Our Captains and Guides have honed their vertical jigging skills with years of experience, and love to teach and show customers the effectiveness of this technique. See the advantage electronics and experienced Captains give Sport Fish Michigan's vertical jigging customers. Sport Fish Michigan's Captains and Guides have worked hard to popularize and promote the vertical jigging technique as being extremely effective and fun for anglers looking for a hands-on experience. 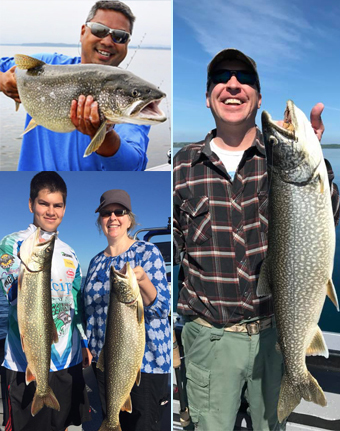 While jigging for lake trout, it is not uncommon to also catch other species like cisco (lake herring or tulibees), whitefish, or even burbot (a freshwater relative of the cod). Vertical jigging for lake trout can be done most of the year, from early spring through to the season closure at the end of September. Depending on the time of year, jigging may produce large numbers of these other species as well, illustrating just how effective this technique is for catching fish. 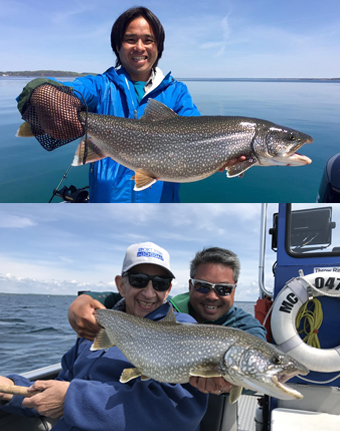 Lake Michigan and Grand Traverse Bays' lake trout are not only hard-pulling fish when hooked, they are also delicious table fare. Their flesh is a beautiful peachy-orange color, very similar to that of salmon, and its firm texture makes it an outstanding choice to bring home for dinner. 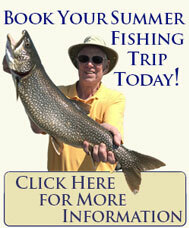 The lake trout diet has changed on the Great Lakes, and they are no longer considered to be greasy as they once were. Sport Fish Michigan has many repeat customers who love to vertical jig because they love the hands-on aspect of this technique as well as the hard-pulling and aggressive nature of these gorgeous fish. 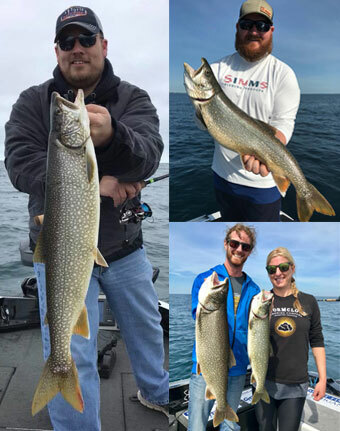 Our Captains and Guides work hard each year to not only refine and improve our techniques and understanding of these amazing fish, but also work to continue to help promote and popularize the vertical jigging technique across Michigan's waters. Vertical jigging for lake trout doesn't have to be done solely on Lake Michigan or Grand Traverse Bays. 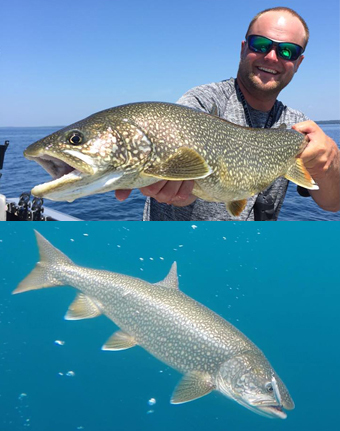 Many of Michigan's deep, glacial lakes are home to lake trout, whitefish and ciscos, and the vertical jigging technique is a great way to target inland lakes as well.